Please make the trek to the sixth floor of 320 Newbury and check out the BAC library's display of materials supporting this spring's Student Lecture Series speakers. Currently on display: Florian Idenburg. 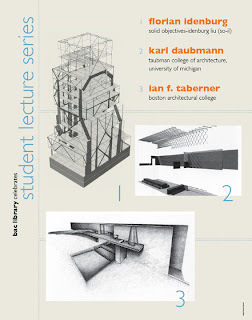 Upcoming: Karl Daubmann and the BAC's own Ian Taberner! In late April, the Cascieri lecturer, Paul Doherty, will have materials on display.